In general, I think (and I am told by students) that I am good as a tutor. However, I would like to become more rigorously familiar with the discovery-based and inquiry-based learning applied to mathematics. Can you suggest some reference material please? Because you used the education-research and reference-request tags, I will give my usual recommendation of Powerful Learning: What We Know About Teaching for Understanding for the reason that Schoenfeld's chapter is well-referenced and written for practitioners. The benefit here is that it is a good introduction to methods of "teaching for understanding" while providing some research background which includes research done on "discovery" and inquiry methods. Because it has a number of influential references in it, you can build a decent reading list from it (and look to Schoenfeld's contextualization). This can supplement reading very recent journals that more specifically target Inquiry-based learning. A simple search give you plenty of reference materials. Here is The Academy of Inquiry Based Learning. And here is The Journal of Inquiry-Based Learning in Mathematics. Enjoy exploring and experiencing. I spent two days sitting in on math classes at Phillips Exeter Academy. 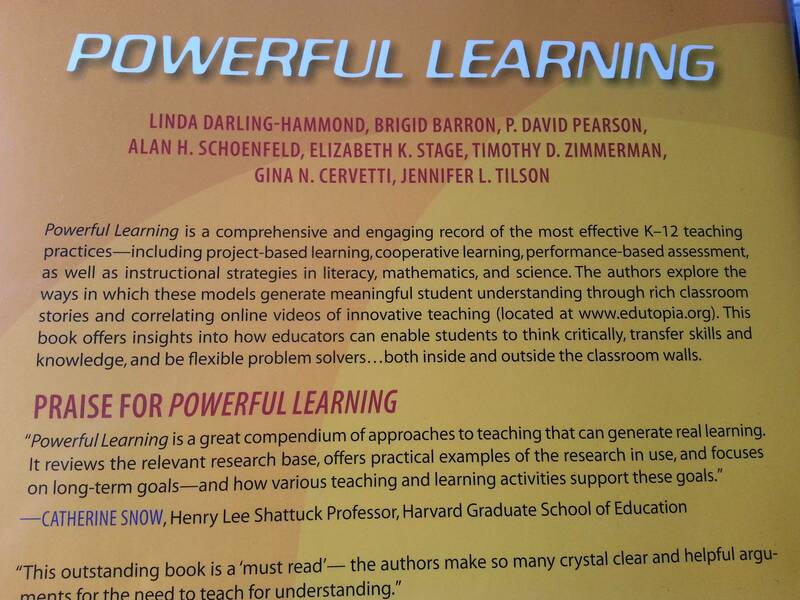 It is an outstanding example of inquiry/problem-based mathematics education in practice. Consider their curriculum. Their format is simple: students do 4-10 homework problems per night (all of these are posted online here), come in to class every day and each put their solution to one of the questions on the board, and explain the solution they put up to the class. Students and the teacher ask questions and (ideally) only move on to the next problem once students understand the solution. It appears to me that this is the only instructional format they use. Students don't know in advance which mathematical tools they will have to use to solve the homework problems. The questions themselves provide the introduction to new ideas. To some extent, the pace of the material covered is determined by the students understanding of particular topics. Students are instructed not to spend more than 1 hour on the math homework each night. 90%+ of class time is spent with students writing up solutions to the problems on the board and explaining and discussing their solutions with the class. The way students explain their solutions gives their teachers crucial information about what students do and do not understand. Students are encouraged (and do) put up solutions to homework problems they have not fully answered. The problem sets have no corresponding solution sets. This seems to require teachers to solve the problems themselves before coming to class, rather than just reviewing the solution. I expect that this exercise sharpens the teachers contribution in class. The teachers rarely rise and go to the board to explain answers. Instead, they tend ask questions to the class based on the discussion. One teacher commented to me that sometimes they go the whole class period without having to enter the instructional conversation (in this case students are explaining the solutions to other students). Because of this, I suspect that teachers there have a relatively low burn-out rate. They certainly seem to expend less energy than they would in more traditional instructional formats. (I was told that) test questions often involve applications of the ideas presented in the homework questions, as opposed to being nearly identical to the homework questions. This is only a brief answer, but I hope that it's a useful counterpoint to the others which present a very positive view of discovery learning. The one reference that I have found most useful for discovery- and inquiry-based learning is the paper Why Minimal Guidance During Instruction Does Not Work: An Analysis of the Failure of Constructivist, Discovery, Problem-Based, Experiential, and Inquiry-Based Teaching. Essentially discovery learning works less well than guided instruction for most groups of learners and this has been shown in empirical studies. The reason it is less effective is that discovery approaches overload learners' limited working memory by requiring them to search for a solution, whilst more guided forms of instruction reduce this load. Here are references directed at teachers more than policy-makers, that analyze teaching from the teacher’s point of view, including the decisions that teachers must make as the lesson unfolds, and how their decisions affect the students. How to Learn Math videos on Youtube from Jo Boaler’s first MOOC for math teachers. Related is Boaler’s site at Stanford, youcubed, where you can sign up for free courses. Not the answer you're looking for? Browse other questions tagged reference-request education-research teacher-development inquiry-based-learning or ask your own question. What Math(s) Ed literature is accessible to the working math(s) educator? Flow diagrams and summarizing strategies in proof-computation courses: good or bad for learning? Unsuitable for Inquiry-based learning?